Click the Custom Session option on the Time axis context menu to control the hours you view when using X_STUDY to research a product. By default, the Time axis is set to Exchange Sessions which is the default times established by the exchange and covers all hours the instrument is open for trading. 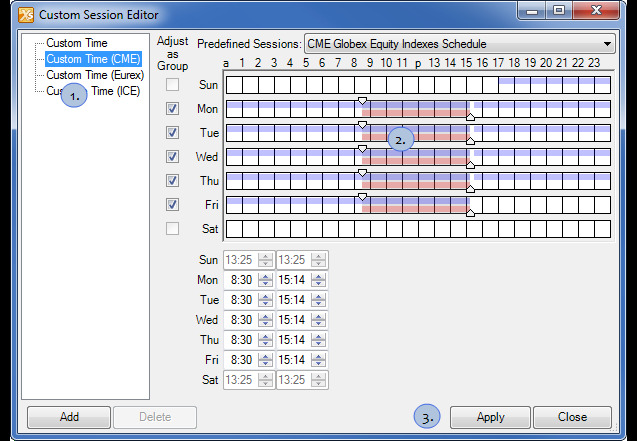 Alternatively, you can choose Primary Sessions, which is the product's most active and liquid times. If neither of these options is right for you, you can create a custom session using the Custom Session Editor. List of custom sessions available for use within X_STUDY. Adds a new custom session. Deletes the selected custom session. When enabled the contract months will adjust in unison. Click to select predefined Exchange sessions. Use these as a template to create a custom session. Set the session time using the slide tabs. The purple bar indicates the Exchange session time. The red bar indicates the Primary session time. Set the session time using the spinner buttons or type directly into the fields. The time adjusts accordingly on the chart above. Saves the custom session, closes the Custom Session Editor dialog, and applies the session to the chart. Saves the custom session and closes the Custom Session Editor dialog.